Is your puppy/older dog a destructive chewer? Read on for more information on how to fix this! Chewing is required in order to maintain your dog's teeth, jaws and gums. Without this mechanism there isn't really any other way in regards to proper maintenance. Puppies especially love to chew things, usually the more expensive things! Whilst chewing is normal for all dogs there is always a limit on what they may chew and when they may chew it. In this blog, Rover and myself are going to show you how to control this behavior and make it work for you. Always remember that chewing is both a normal and necessary thing for your dog to do, it is also natural to them. Dogs will, at the most times, generally sleep during the night and day. As a result chewing will be their main form of entertainment during early morning and afternoon. When I say "early morning" I mean as soon as you have left the house for work. Chewing as a result is your dogs way of passing the time when you, their owner are not around. Now that we know this is completely normal behavior, how do we go about putting a stop to this? Well I'm glad you asked! There are many ways of going about this, there are also a few ways that stand out. These are the ways that stand out the most for me and have worked for me in the past. Possibly the most trying time for both you and your puppy is when they start teething. A simple and effective way of controlling this is to start as young as possible. Get them a crate (you should have one already) and place this in the puppy's "confinement area". Allow your puppy to spend up to an hour at a time in their crate with their favorite chew toy. This area needs to be quiet and also make sure your puppy has a comfortable blanket to lie on. After each hour goes by you will let your puppy out and observe what it does. Take its favorite chew toy to him/her and keep it nearby. After a while your puppy will soon realize that chewing their favorite toy is all that they need. This process is a little time consuming but is worth the results in the end. Remember to always observe your puppy and to not leave them alone. 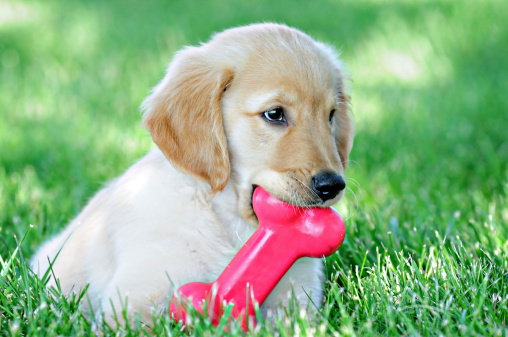 The purpose of this exercise is to maximize the chance that your puppy will not develop any chewing habits and to only chew the provided toys. The above method is ideal for the puppy to "self train". But what if you would like to do something a bit more hands on for the both of you? Another method is to offer praise. Every time you see your puppy chewing on their chew toy offer them a treat and praise them. Make the praise as heartfelt as possible. This method takes a little longer but also brings you closer to your puppy. Always remember to not take toy chewing for granted. If your puppy is chewing on a chew toy walk over and say "good boy/girl" and give them a treat. If your puppy brings the chew toy to you this is even better, again "good boy/girl" here's your treat! Remember to be patient and consistent. Until your puppy is fully chew toy trained practice a few days a week feeding them solely from chew toys that you can stuff with their food. This will also help with redirecting their chewing habit back to their chew toys! - Rover, office dog at The Woof Academy.